MSP John Finnie joins Holly Gillibrand and fellow students in strike outside Lochaber High School. A Highlands and Islands politician has backed a group of young activists campaigning for more government action to tackle climate change. 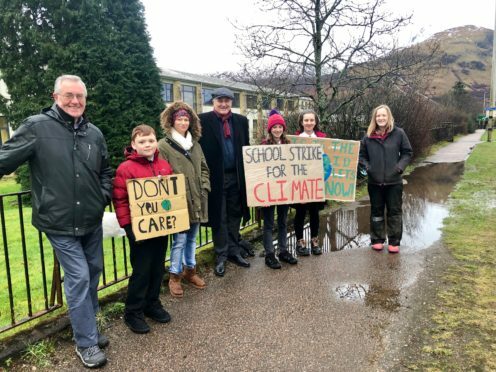 Green MSP John Finnie took part in the organised strike outside Lochaber High School on Friday alongside 13-year-old campaigner Holly Gillibrand and other students. Holly staged her first strike last month as part of the Youth Strike for Climate Movement in an effort to raise greater awareness of the issue. Mr Finnie said: “It was a pleasure to join the Lochaber climate strikers at their picket. “The climate emergency is the biggest threat facing humanity, and it is inspiring to see young people tackling the issue head on.